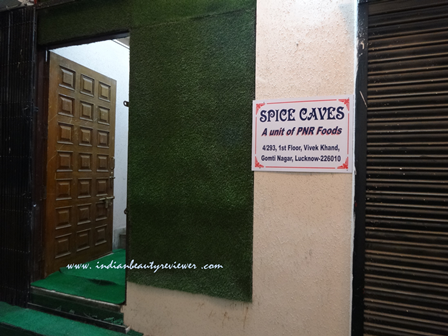 I am a die-hard foodie so when I recently got an opportunity to visit one of the newly opened restaurants in Lucknow called SPICE CAVES I just couldn't help but say Yes. 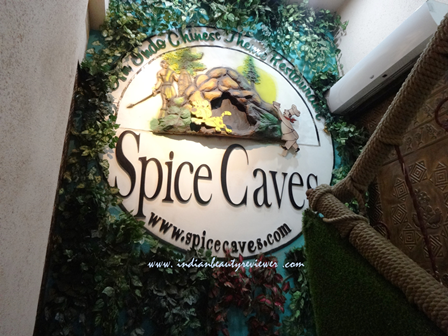 Lets begin with the exteriors first... Spice Caves is an Indo-Chinese Themed Family Restaurant situated in the busy market of Patrakar Puram, Vivek Khand-4 , Gomti Nagar, Lucknow. 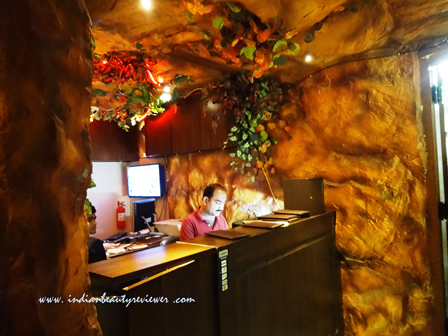 It`s the talk of the town these days more so for its interiors that are designed like a cave. 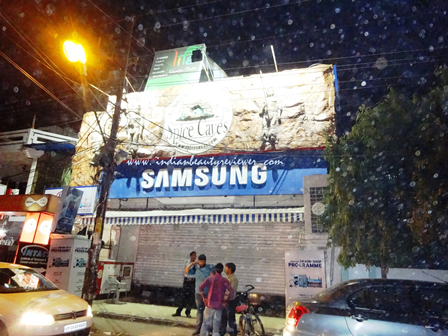 I spotted the restaurant sign board above the Samsung showroom and went on to explore it. From outside it didn`t look like it was much roomy but that perception of mine changed once I entered it. 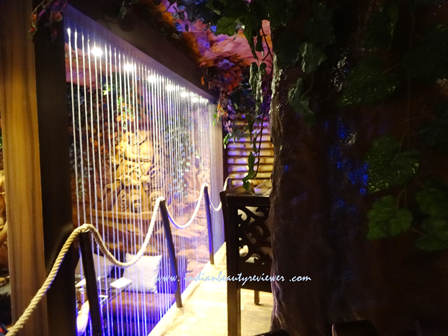 The entrance door which leads upto the restaurant on the first floor via a staircase. 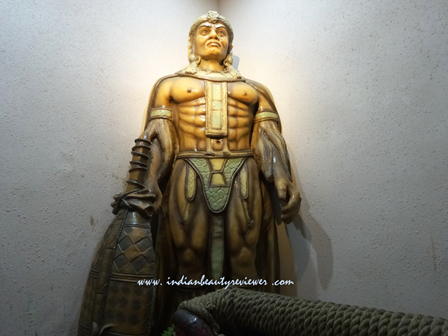 A beautiful cave-man like soldier statue in the middle of the staircase matching with the 'cave' theme of the restaurant. 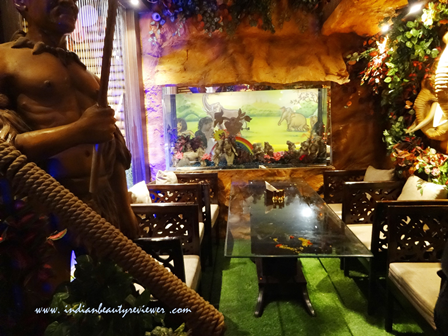 On reaching the first floor I saw a beautiful mural on the wall matching with the sign board of the restaurant visible from the roadside. 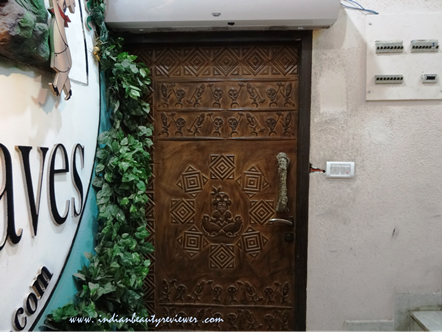 The entrance door to the restaurant was a beautifully carved heavy wooden door. 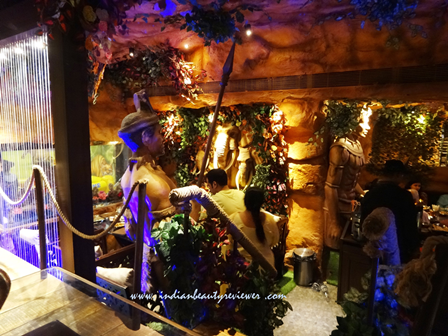 The door had dancing aborigine carvings again matching with the intriguing cave-man theme. On entering the restaurant, I was quite surprised to see that there was barely a table vacant. 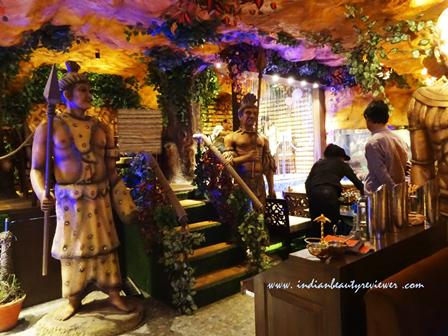 It was hustling and bustling with people, food and laughter yet the ambience was quite mellowed. 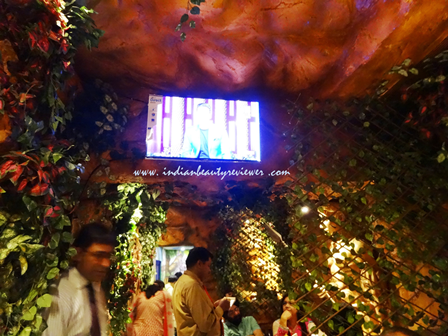 The restaurant was fully air-conditioned and the temperature was faily cool and comfortable as compared to the extreme heat outside. 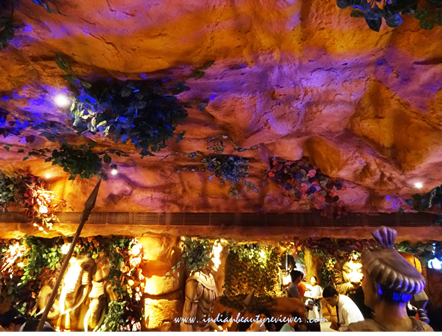 This could be because of the restaurant interiors which resembled those of a cave with dense leafy creepers all over the walls and the roof. 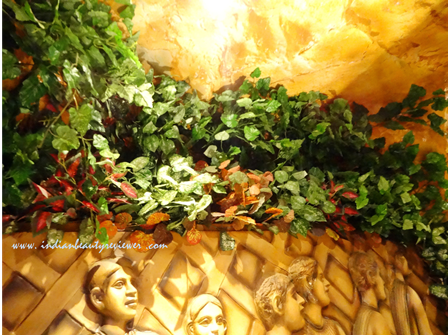 The murals on the walls were astonishingly beautiful...I was intrigued and started looking around to absorb the beauty. On the extreme right hand side of the restaurant was a raised section with tables. 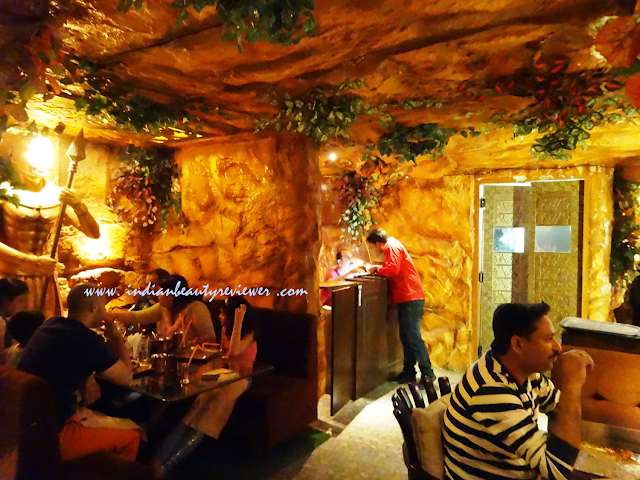 It was somewhat secluded from the remaining restaurant being at a different level and on one corner. A table was reserved for me there but I moved on to explore a little more. 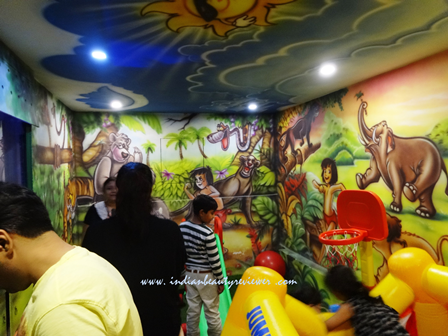 I went further ahead to realize it was a recreation room for the kids...There were several toys in there and the children were busy enjoying them with their parents watching over...The room was designed keeping the Jungle-Book theme in mind! So after exploring the restaurant I headed back to my table. On my way back I also spotted a television set for guests who would like to catch up on the evening news or the match score. 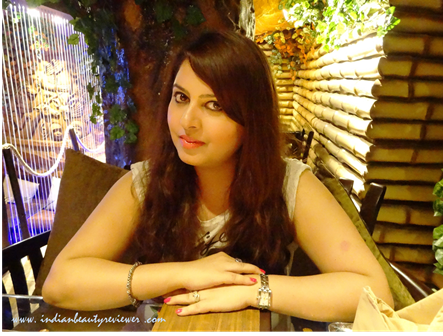 That`s me sitting poisedly after having taken a guided tour of the restaurant ready to be served the delicacies. Then served was cold bottled water, assorted pickles n chutneys and the serviette was beautifully folded. 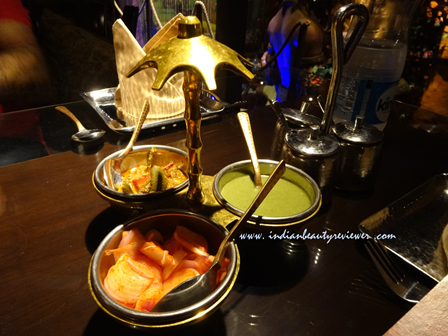 What struck me most was the cutlery which was a blend of copper and modern textured silver. 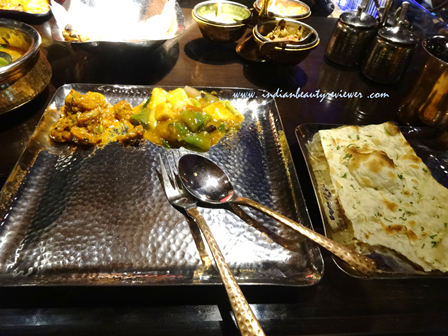 The menu was offered and I chose a few dishes from the Chinese as well as the Indian categories. I was told that the complete menu of the restaurant is available on the zomato website in case one would like to pre-order or makeup one`s mind in advance what he/she would like to have once they reach the restaurant. 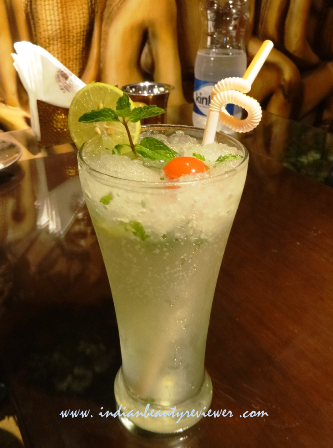 For drinks I ordered a good old Mojito with mint leaves, lime juice, crushed ice with soda and sprite. 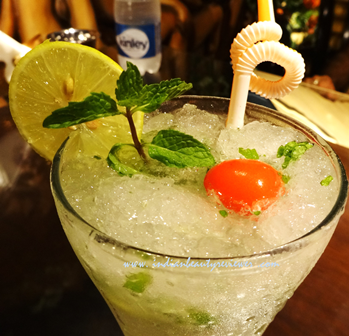 It is one of my favorite mocktails and is a great summer refreshment. 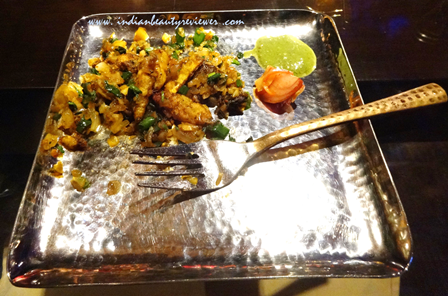 I mentioned to the connoisseur that my favorite cuisine was Chinese so in starters he suggested me to try Crispy Mushroom with Baby Corn. It was so delicious and I am happy I ordered it. 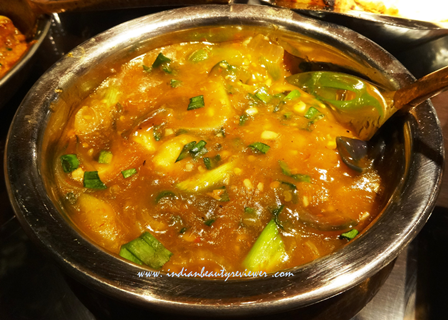 It had fried mushroom and baby corn pieces in salt and pepper sauteed in chinese sauce. So very yum. Then it was time for main course ... I ordered one dish from Indian and one from Chinese category. 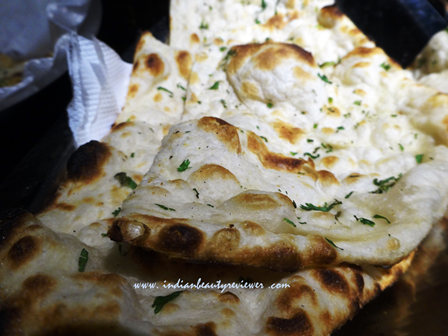 I also ordered two kinds of Indian Breads. I skipped the rice that day as I had already had lots of rice to my heart`s content during lunch that day. Also, I only ordered vegetarian dishes since I am one. 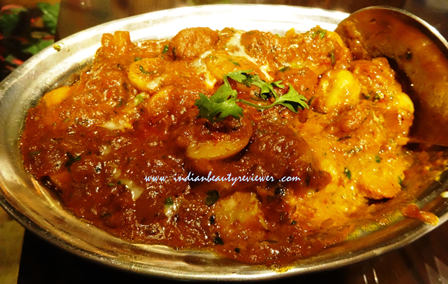 This was a delightful rich dish loaded with mouth watering mushrooms in a creamy gravy with a hearty mix of spices. 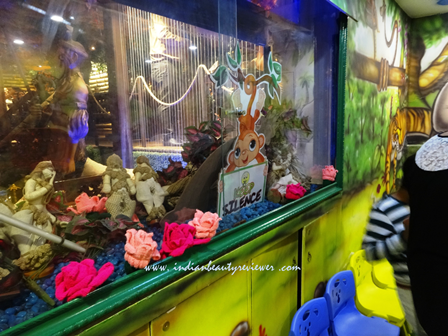 anyone who loves mushrooms would go head-over-heels for it just like I did. 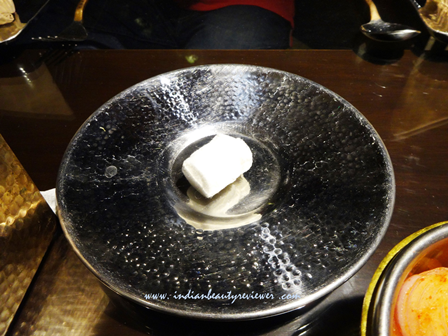 A good old chinese chilly paneer has always been my favorite. I like a little extra gravy/sauce in my dishes and that is what I was served. 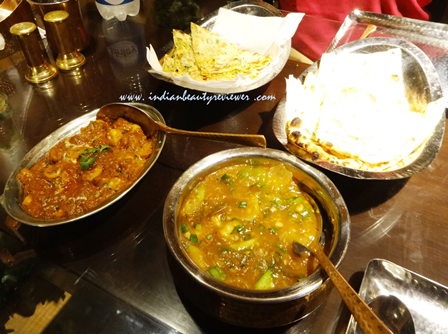 I am more used to a much spicier and redder looking chilly paneer and to my liking it was a little bland. I would have preferred a spicier version of this dish but nevertheless I still enjoyed it. 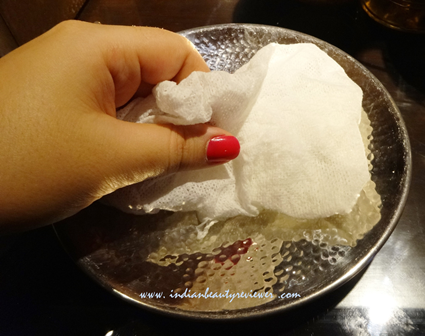 The cottage cheese pieces were fresh and had the perfect soft rubbery texture. 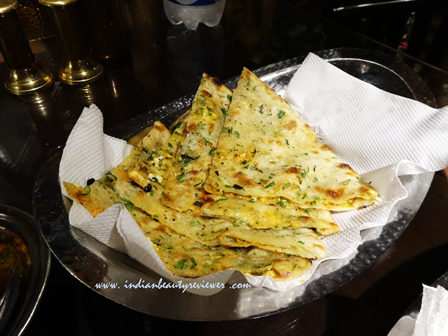 The stuffed nan was super soft and succulent. 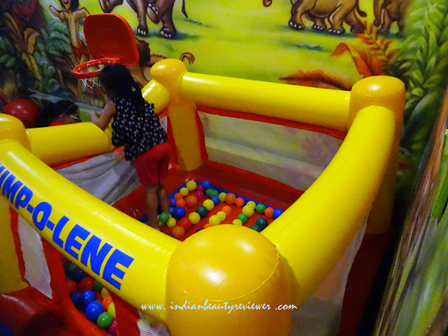 It was stuffed to its utmost capacity which made it amazing. I enjoyed it thoroughly. 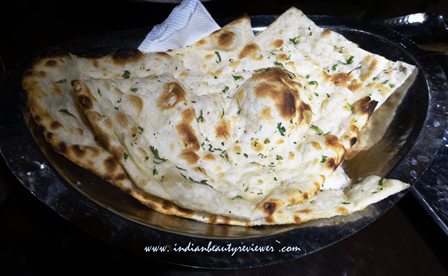 I ordered Tandoori Roti without any butter/ghee yet the roti was super soft and the dough tasted very fresh. 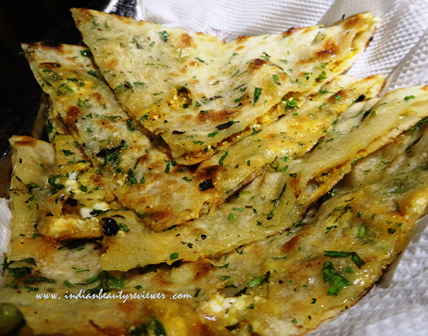 It has bits of fresh finely chopped coriander which was giving it a lovely taste. They were baked to perfection. After a hearty meal its was time for dessert. 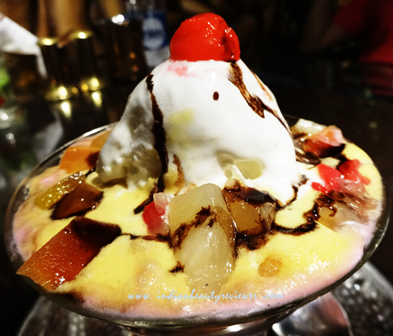 A fabulous meal is never complete without a mouth watering dessert. 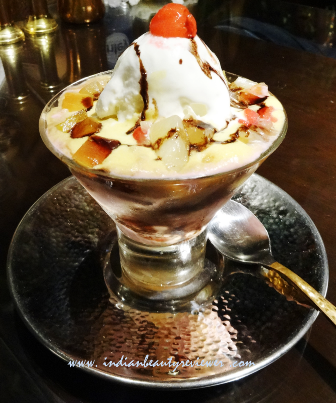 There wern`t many choices in dessert unfortunately, but a good old sundae icecream in a cup is not only a lovely sight but a perfect sweet ending to a mouth watering meal. Children and adults both love this non-fussy dessert. 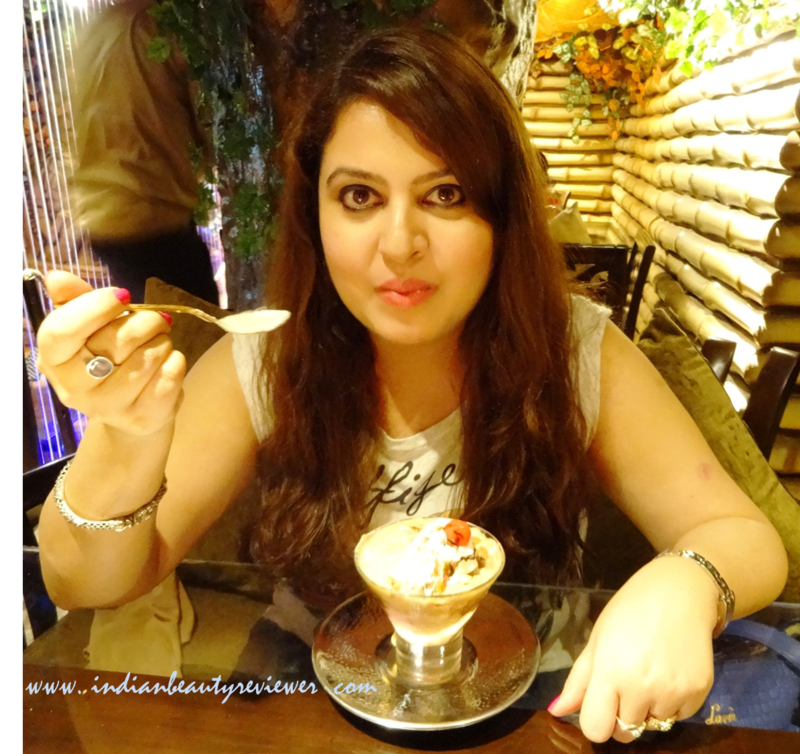 Thats me again enjoying the sundae after savouring the delicious meal. 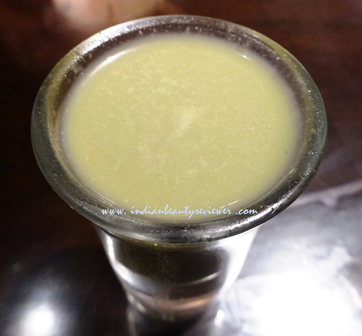 After thoroughly enjoying my dessert I thought the lovely night had come to an end but to my surprise I was offered a Pan Shot which was a Pan flovored creamy milky drink which contained Pan (betel leaf), and other digestive spices. 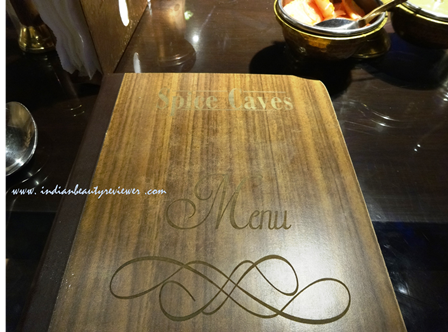 I have only ever had it in Spice Caves and never before. 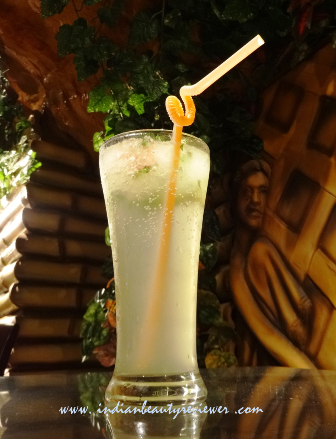 It was so yummy and I appreciated it so much that I was offered another one by the connoisseur. 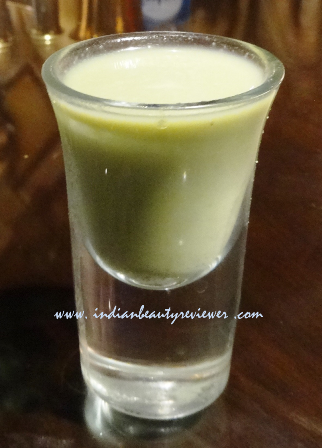 This is a must try if you ever visit Spice Caves. 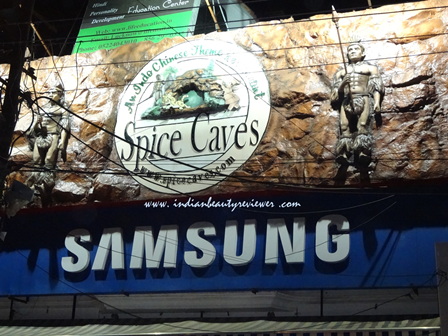 I would like to thank the team of Spice Caves, Gomti Nagar, Lucknow who were so warm and welcoming. 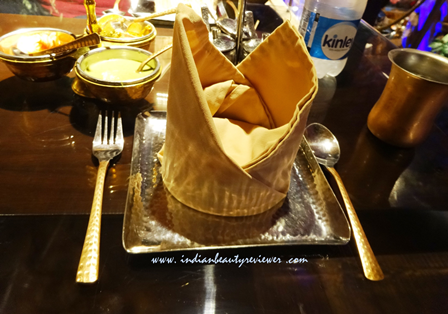 Their food and hospitality was amazing and I truly felt like royalty. It was an experience to remember. 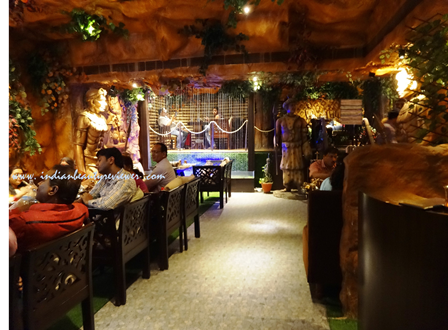 I would definately urge you all to visit the restaurant to experience the taste and ambience yourselves. I am sure it would be wonderful !